November is National Blog Posting Month. This year I decided to try to do a post a day for the whole month, and great creatures keep popping up for their turns to be featured! 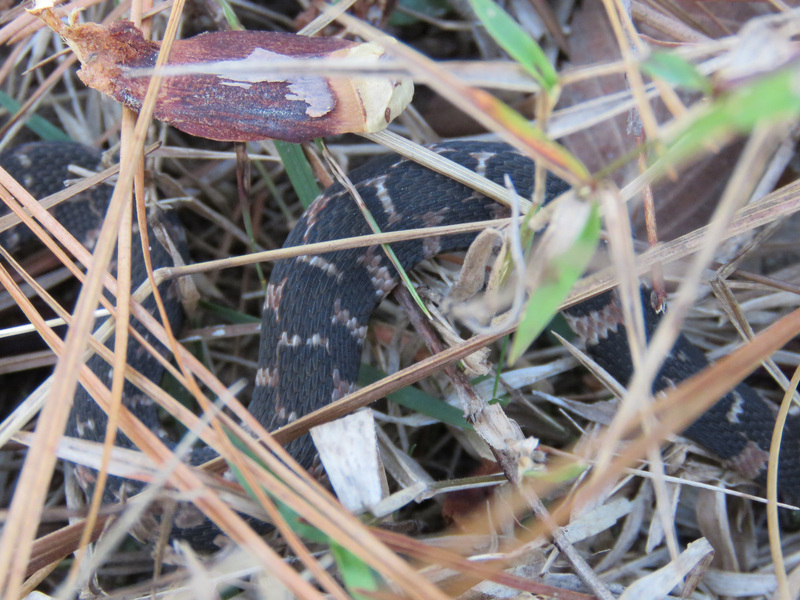 Right after I posted the pictures of the Western Ribbonsnake, I saw another snake, one I have never seen before. I was leaning over to look at a white splotch on a leaf – sometimes that is bird poop, and right next to it will be an owl pellet or a hawk’s leftovers – and a few feet away, I saw a dark brown or black snake looking at me. By the time I turned my camera on, one of the sheep had spotted the snake too and stuck his nose in its face to see what it was. The snake fled and I didn’t get any pictures or even a good look. 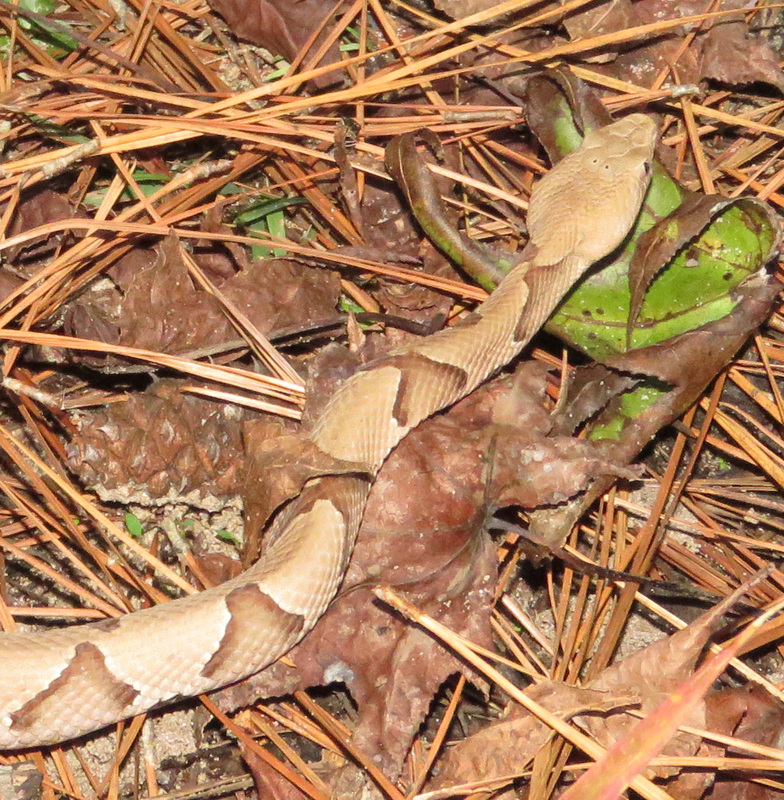 But the next day on our walk, I saw this Southern Copperhead – after every single sheep, goat, and dog had stepped right over it! 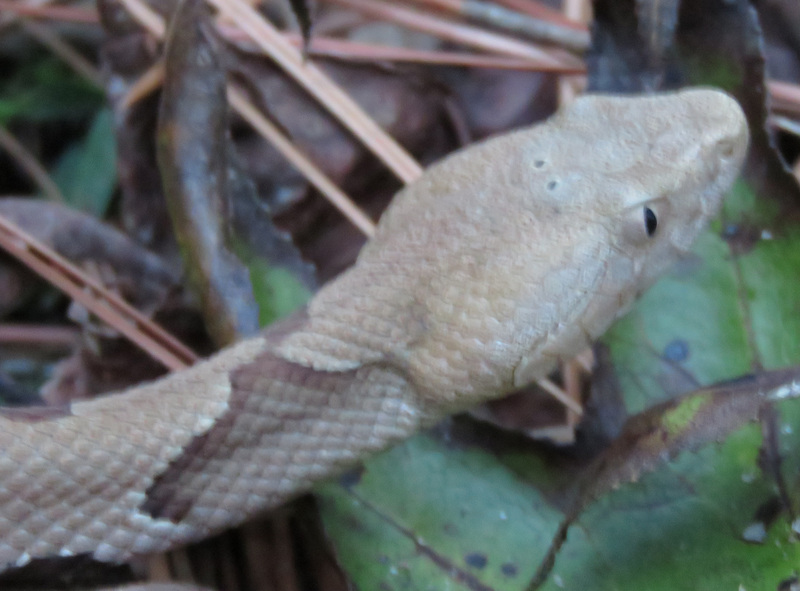 Southern Copperhead, Agkistrodon contortrix. The “Hershey’s Kisses” pattern is a great identification reminder. Copperheads are venomous, so I look out for them. We see them from time to time, but they are usually under boards or plants or logs — when we lift a log or pull weeds, one might come out and slide away (which is why I always wear gloves when doing that kind of work). I have never seen one just out on the path like this. The shadows of the tree branches camouflage the snake. I was just a few feet away from this snake when I noticed it, and it stayed pretty still while I took pictures. I never mess with them at all and I keep my distance, but I have never had one even move toward me. And about a week later, I was at our local state forest to help with a school group on a field trip. After an uneventful morning where 160 8-year-olds learned about wildlife, wildfire, wood, and water, staff and volunteers were relaxing while the kids had lunch. When I saw a about five of these naturalists in a tight group looking in one direction, I knew something interesting was over there and went to join them. It was a Western Cottonmouth! Another venomous snake, and one that can be aggressive. 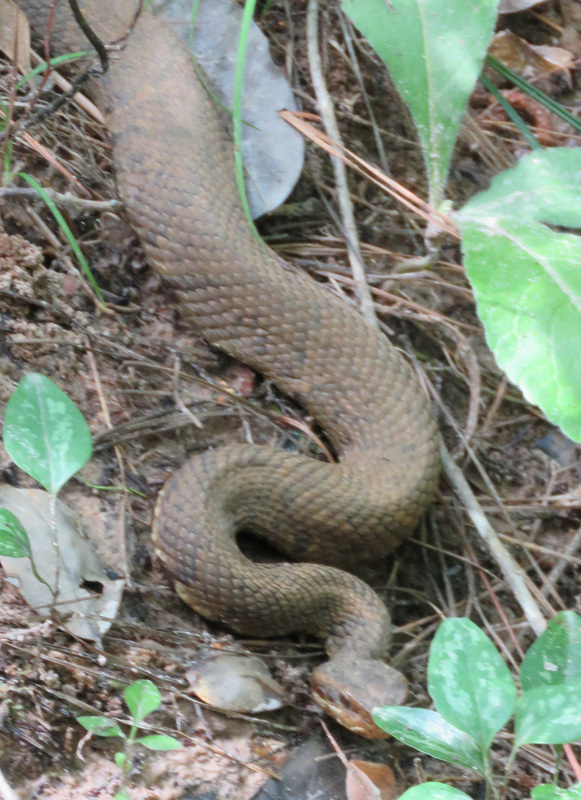 Western Cottonmouth, also called Water Moccasin. I saw this one back in May, about 30 miles east. The patterning on this more recent one would have thrown me off, and it looked thinner than I expect cottonmouths to be. Also, it did not do the typical behavior of opening its mouth wide to show the white interior (that it is named for), providing one less clue to identification. Dawn, the forester/fire fighter among us, moved the snake into the water, just to keep it away from all those kids (not a one of whom ever noticed what was going on). Come to think of it, Dawn was with me the other time I saw a cottonmouth, so I am going to have to be more wary around her. 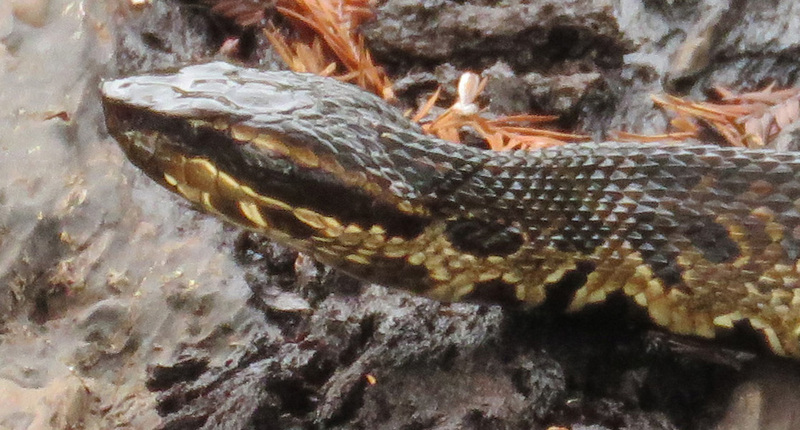 The snake crawled up on a fallen log and I was able to get some pictures of its striking patterning. 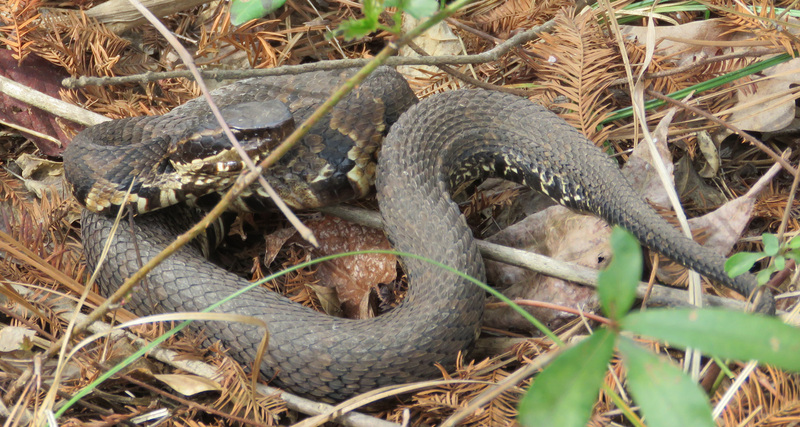 Cottonmouth with bald cypress needles. One thing that snake books always tell you about identifying snakes, is to look at their eyes and see if their pupils are slits (venomous snakes) or round (nonvenomous). As everyone always says, “who wants to get that close?” And I think these pictures also show how difficult that is. I had a perfectly clear shot when the snake was on the log, but the black coloration around its eyes and the angle of its head really make its pupils hard to see. Even when I lightened the picture with photo editing, I couldn’t tell where its eyes were exactly, much less see the pupils. Pupils like slits? I can’t even see exactly where its eyes are. And then today, I saw this little one on our daily walk. This is a juvenile Blotched Water Snake. Either this is our Snake Species 11 on the farm, OR the snake that I just recently saw and thought was a Yellow-bellied Water Snake was really a Blotched, and this is one of its offspring. 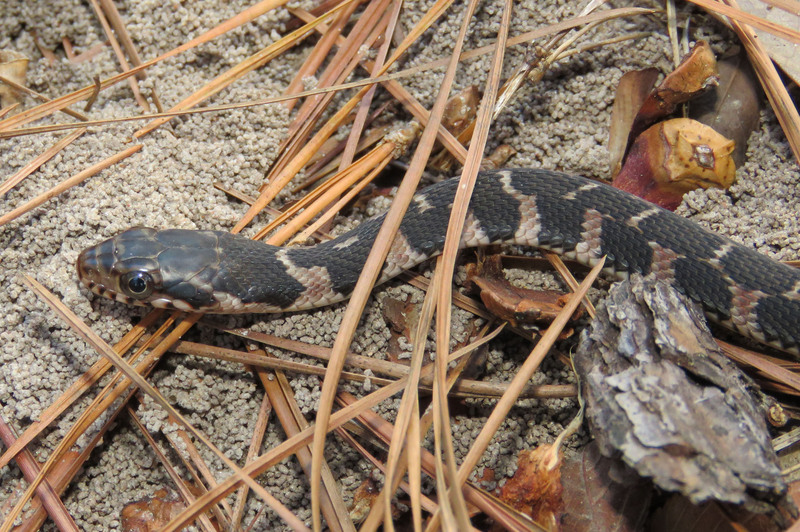 Blotched Water Snake among the pine needles. 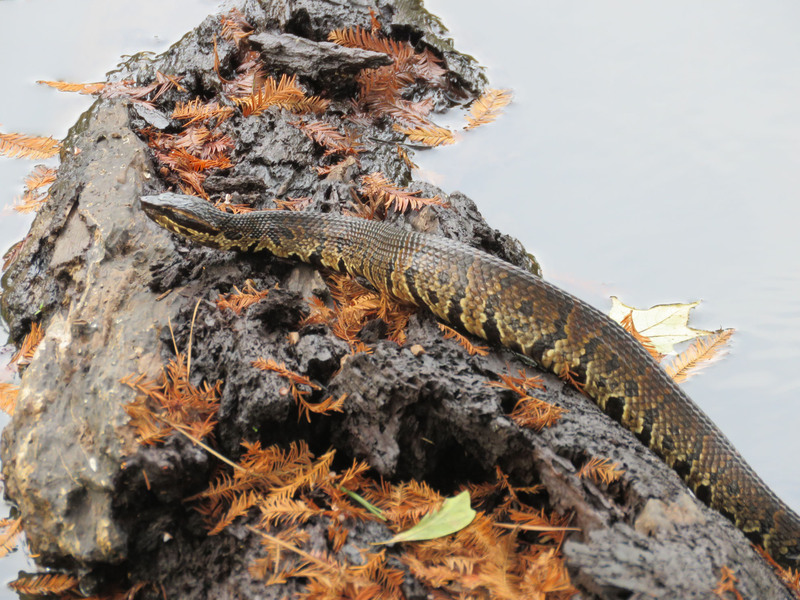 Blotched Water Snake, Nerodia erythrogaster transversa, juvenile. After a while it cooperated and went into a clearer spot for its photo op. 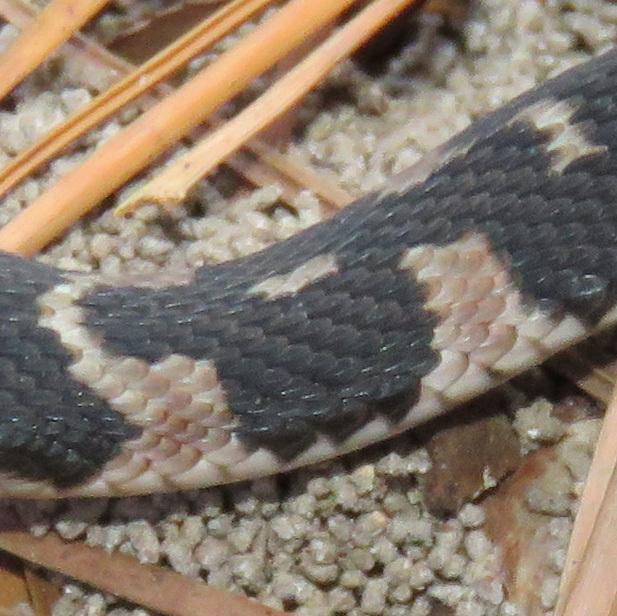 Close-up of its beautiful black and pink scales. Compare the scales to the grains of sand beneath the snake to get an idea of their size and detail. 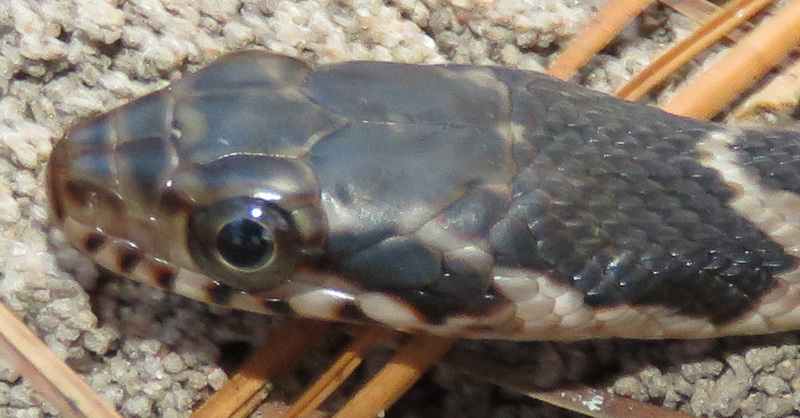 Close-up of its head. Now those are some nice big round pupils. So that is seven species in two weeks, six here and one in the state forest. Most years I don’t see six snakes the whole year. I guess they just want their fifteen minutes of fame! Wow, my daughter would have flipped! We get little garter snakes and she talks about them for a week. She loves them. Great shots, thank you for sharing! Oh yes it is. I used to be crazy afraid of spiders… Complete irrational fear. And then, my daughter fell in love with them. Our garage was full of them, they were laying eggs on the windows, eating and weavong new webs every day. She named a few that stayed with us, undisturbed from mid Spring to late fall. We did research, identified them, watched documentaries… By the end of the year, I was in awe of them. Now, although Im still not crazy about them falling or climbing on me, I’m not afraid anymore. It’s amazing what can happen when you allow yourself to look at the world with the eye and heart of a child. Wow – you have some great photos in there! Mind you, I think I’d rather plunge into an icy waterfall pool than come eyeball to eyeball with a cottonmouth… So, yes -I’d prefer an ‘appreciate’ button to a ‘like’ button as well! I thought last year was a record-breaker for snake sightings, but this year has recently topped it. I think all the rain we had in the spring led to an unusual number of frogs, so the snakes have plenty of food. Or maybe I’m just looking around more closely!